Julie is 48 years old and lives alone in a public housing unit. In the past Julie has struggled with alcohol addiction, and has recently escaped a violent partner. She suffers from post-traumatic stress disorder (PTSD) and osteoporosis, and is recovering from a severe ankle injury that restricts her mobility. Julie’s gas supply was disconnected for about two weeks at the end of 2014. 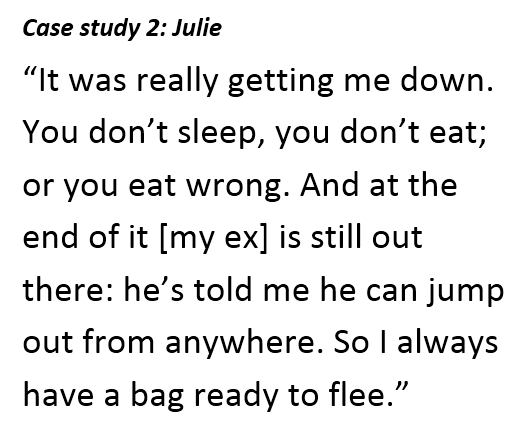 Around that time Julie was supporting a friend, who slept on her couch and cost her a lot of money. Her car was then struck by another car, creating extra costs. Unable to work because of her injury, Julie fell behind on her bills. AGL, her gas retailer, threatened her with disconnection. Until this point Julie had paid her bills by automatic direct debit, and says she was often ahead in her payments. Eventually AGL disconnected Julie’s gas supply, meaning she couldn’t use her stove or hot water. Julie boiled water in the kettle to cook instant meals, and used a bucket to wash. Eventually Julie came across a financial counselling service, which she says helped her immensely. The counsellor advised Julie to call EWOV and stop speaking to AGL. He and EWOV then negotiated with AGL on Julie’s behalf and her gas was reconnected a day or two later. They also discovered that Julie wasn’t receiving the concessions she was eligible for. Meanwhile, disconnection and reconnection fees increased her debt.